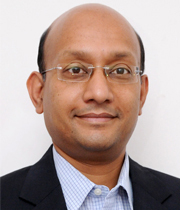 Ranjan Bose is the Director of the Institute. Prior to joining IIIT-D, he was Microsoft Chair Professor in the Department of Electrical Engineering at IIT Delhi. He has also served as the Head of Bharti School of Telecom Technology and Management and as the founding Head of Center of Excellence in Cyber Systems and Information Assurance at IIT Delhi. He received his B.Tech. degree in Electrical Engineering from IIT Kanpur and M.S. and Ph.D. degrees in Electrical Engineering from University of Pennsylvania, Philadelphia, USA. He is the author of the book Information Theory, Coding and Cryptography (3rd Ed.). This book has an international edition and has been translated into Chinese and Korean. He is the national coordinator for the MHRD Mission Project on Virtual Labs, which enables students all over the country to perform laboratory experiments remotely. He has also contributed to the National Program on Technology Enhanced Learning (NPTEL) and the National Pedagogy Project. He has served on the editorial boards of IEEE Access and Computers & Security (Elsevier), and has been the Editor-in-Chief of IETE Journal of Education. He has also been on the Security Advisory Board of GSTN. He is the recipient of the URSI Young Scientist award, the Indian National Academy of Engineers (INAE) Young Engineers Award, the AICTE Career Award for Young Teachers, the BOYSCAST Fellowship and Dr. Vikram Sarabhai Research Award. He is Fellow of IET (UK) and Humboldt Fellow (Germany). Secure communications, coding theory, 5G security, wireless security, physical layer security and broadband wireless access. Information theory, coding theory, physical layer security, wireless communications.